Production has finally begun on Disney’s sequel to The Muppets, which means that we finally get an official title and an even more official plot synopsis. The title? The Muppets … Again! And the plot synopsis? Not to throw a rubber chicken into the works, but haven’t we done this before? In a movie called The Great Muppet Caper, where the Muppets become involved with international jewel thieves? I’m pretty positive we did. Constantine is even chasing after “an enormous diamond”, which is, uh, what happened in The Great Muppet Caper with Charles Grodin’s jewel thief. Disney is definitely getting mileage out of the reinvigoration of the Muppets. I admit that I’m still of two minds on the first film, which was fun and self-aware as always, but still a bit glossy. I kind of miss the edge of satire and even griminess attached to the original The Muppet Movie and The Muppet Show. But then again, I’m not really the target audience. It’s all about the kiddies, and I’ve got to say that if this is getting a new generation of kids into the Muppets again, then more power to Disney. Maybe Bobin and Co. have something new up their sleeve for this one. After all, The Muppets was all about saving a theatre, something which has been done time and again, and it managed to be fresh and entertaining. I’m just wondering if they could not have found some other plot that did not sound quite so similar to a Muppet classic. 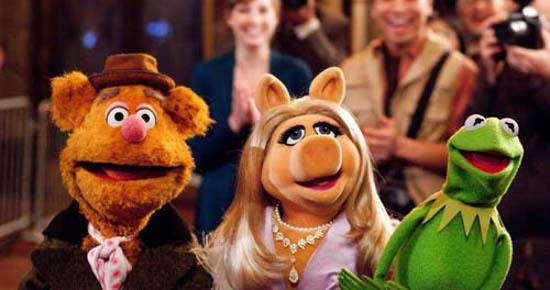 The Muppets … Again! is due to hit theatres March 21, 2014. 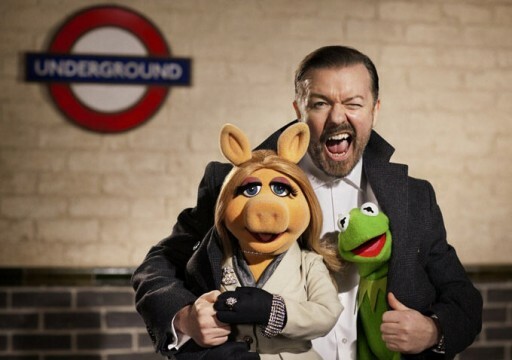 Before then, you can check out the latest image of Ricky Gervais, Kermit and Miss Piggy below.